Growing up in a Chinese family meant one thing at dinner: RICE! Every nightly meal was accompanied by a bowl (or two!) of this freshly cooked, steamy, staple grain. And as the week progressed, my mother would collect any leftover rice and at week’s end, she’d make a stir-fry with it. 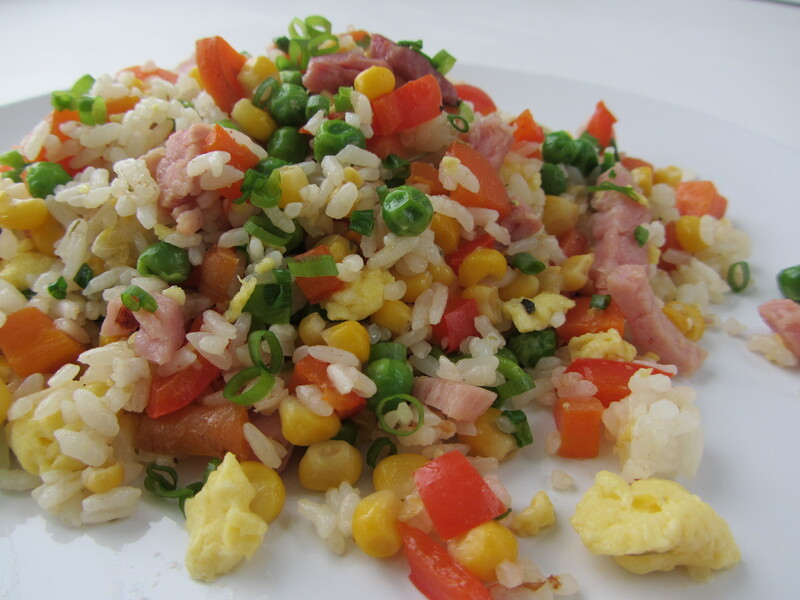 I’m hesitant to call this “fried rice,” because it is not like what is found on the take-out menu. It is similar in composition, but for this recipe, it isn’t actually fried, or weighed down with oils. I call this dish a “rice stir-fry” since that is pretty much the most straightforward way to describe it. It is essentially a stir-fry, mostly vegetables, in which leftover rice is then added. The purpose of my mother (or any other Chinese mother out there) making this was a way to use up leftovers and turn them into a new, simple one-pot-meal. It is pretty much the origin of fried rice, and the idea behind it is the basis of many, many recipes in cultures all over. In this instance, I am listing the particular ingredients used in the version pictured, and give measurements as a general guide on ratios and proportions. But I encourage you to be free with it, you can really change it up and do anything you want to it. It’s about being easy after all! 1. Reheat the rice in the microwave until hot, break up any clumps if needed to separate the rice grains. Set aside. 3. Bring pan up to medium-high heat, add 1 tablespoon of olive oil, then sauté the corn until the kernels begin to brown around the edges. Remove corn from pan, set aside. 4. Add the carrots and bell pepper to the pan, and cook until tender, stirring occasionally, about 6-8 minutes. When the carrots are tender, return the corn and eggs, and add the ham and frozen peas, and cook until the peas are heated through, 2-3 minutes. 5. Add the rice and scallion, toss to evenly combine into the pan. Season to taste with salt and pepper. * The secret behind this recipe is to cook all the ingredients separately, then combine them back together.